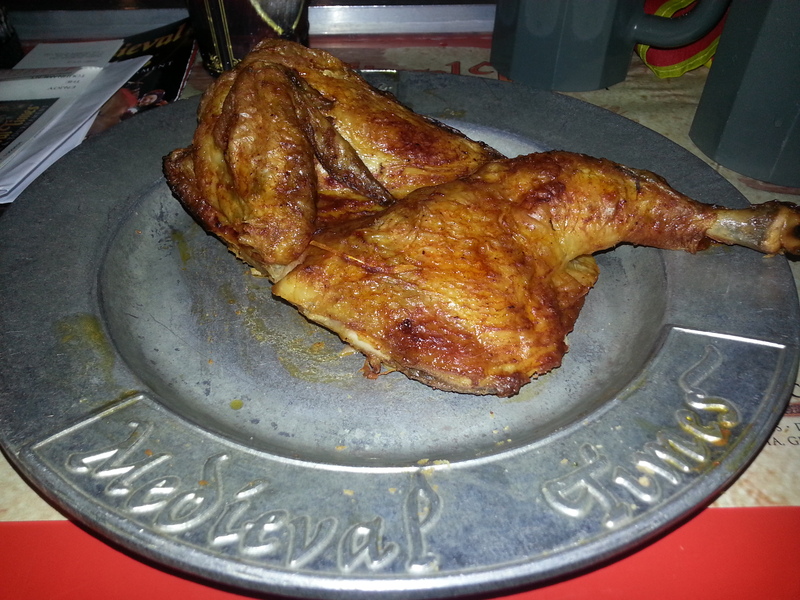 I had not been to Medieval Times Dinner and Tournament in about eight years, so I was very excited to check it out and find out what changes had come about. 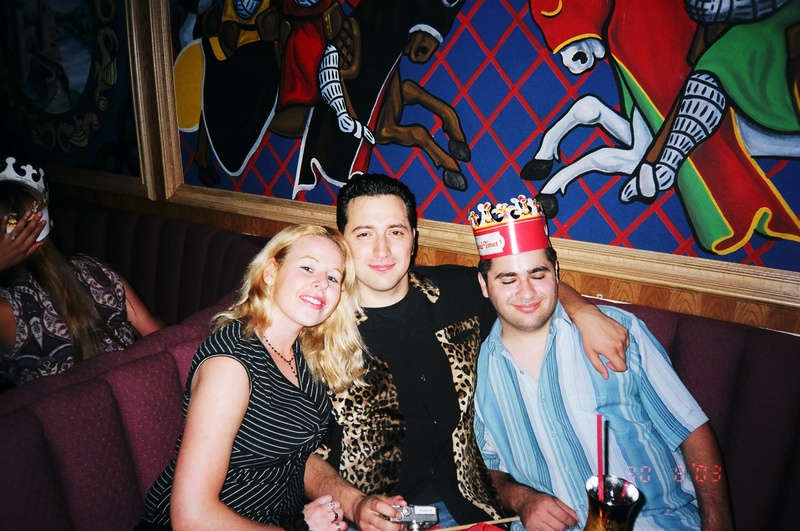 The Medieval Times I am referring to in this article is the one in Buena Park. When arriving at Medieval Times, it seemed smaller than I remember…I think it is because I went there so much when I was younger. The castle is still quite easy to find on Beach Blvd. in Buena Park located next to the Pirate’s Dinner Theater and across the street from the new Titanic & Bodies Exhibits (formerly the Movieland Wax Museum) It is conveniently located off the exit of the 91 freeway. 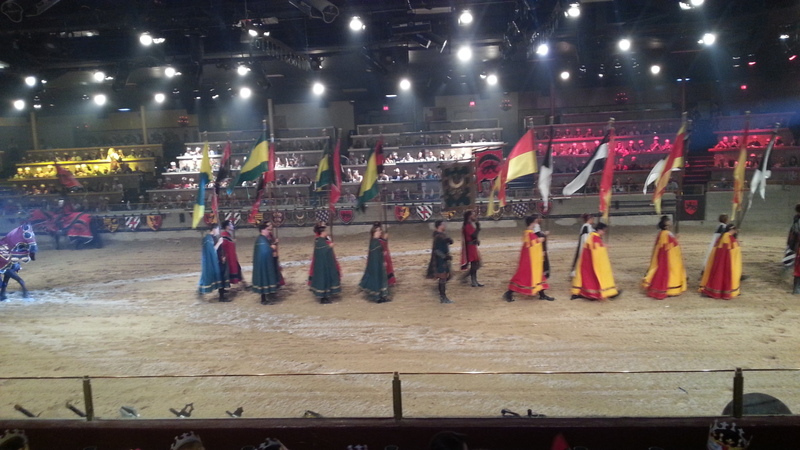 There are several other Medieval Times Locations throughout the US and one in Canada. See my Castle Map picture for all locations. 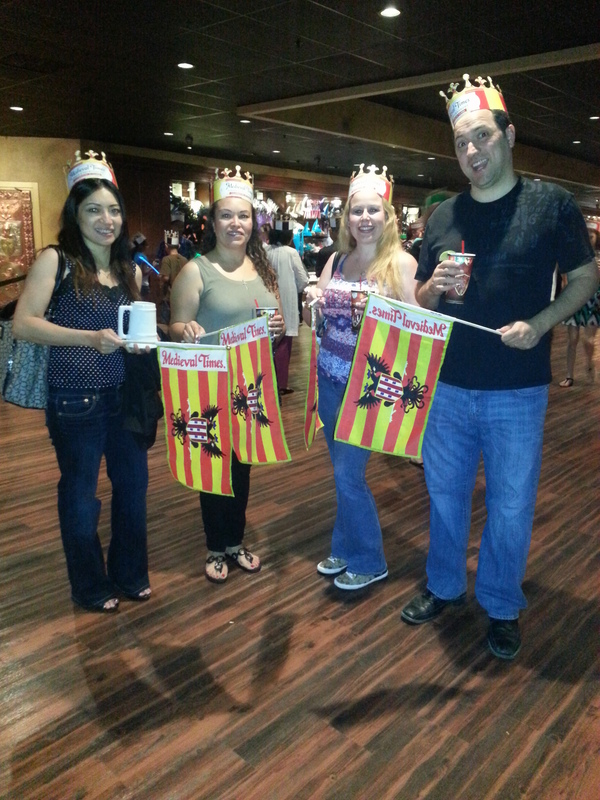 Medieval Times currently is celebrating 30 years in business! Tickets are $35.95 for children and $57.95 for adults plus taxes and processing fees. For several special offers for Medieval Times, there is a special offers section on their website as well with coupons and there is a group discount section as well. 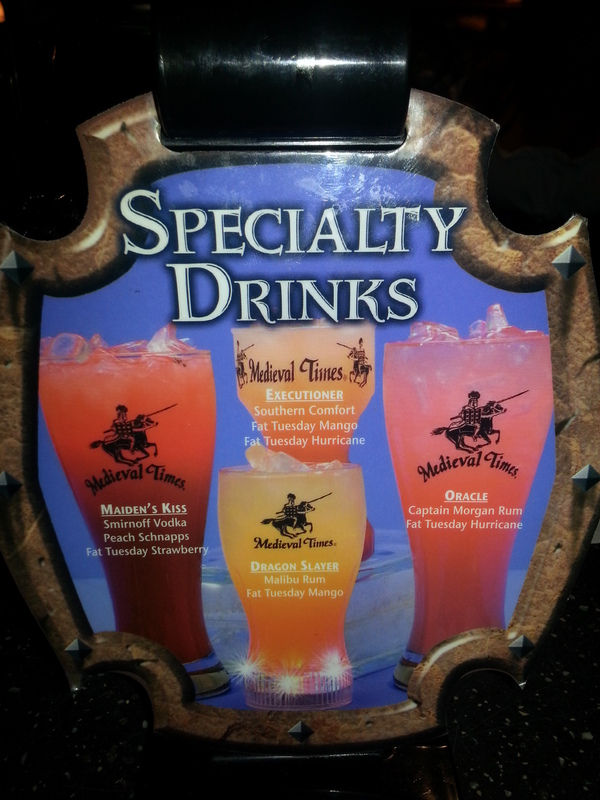 For special offers, click HERE For group discount opportunities, click HERE Medieval Times also has many reasonable celebration packages for celebrating birthdays, corporate events, etc. See link here for packages: CLICK HERE. When entering the castle there is a picture opportunity with “a lord and a lady.” After taking our group picture (which you have an opportunity to purchase at dinner time and I did…) we proceeded to enter the main building. When entering, there is a bar with several fabulous mugs to choose from as souvenirs and plenty of poisons to select to fill in your glass. There were a great variety of “fruity drink alcoholic beverage options” that myself and my two girlfriends selected and my husband had a gin and tonic. As we purchased our drinks and continued to enter the large room, there was a gift shop with swords in which my husband’s eyes gravitated to. In the gift shop there were options to purchase many type of different swords as well as fun flags by color to cheer on the color of your team in the show to come. My husband bought the four of us flags and we were excited to enter the dinner theater for our show to start. 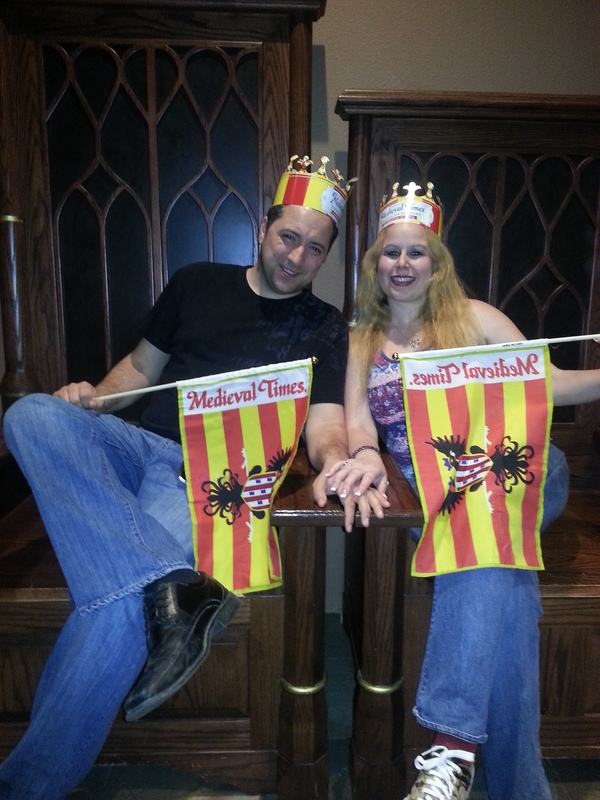 While waiting for the show, there is a “knighting ceremony” where lucky people are selected to be knighted by Medieval Times Staff and have awesome picture opportunities. As the time for our dinner show approached, we were shown to our seat by color and the excitement began! Upon being seated in the color section you are chosen to represent, the excitement grows. 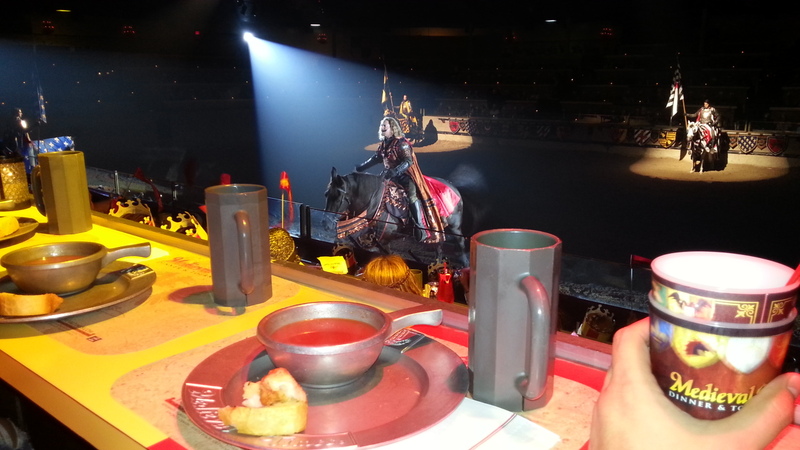 Medieval Times has an impressive size stadium and the utensil-free meal is certainly a feast fit for a king! To subscribe to my blog to get weekly deals like these and other dynamic ways to save and to live champagne dreams on a beer budget, simply scroll down & enter your email address where it says to follow blog via email. You will then receive an email asking you to confirm subscription. Simply confirm subscription and you will be subscribed. Thank you for your time and feel free to spread the word to others that want to learn all different kinds of ways to save money on food, travel, shopping, and products:) Please feel free to like my facebook page, Dani’s Decadent Deals as well to get daily deals everyday for everything from clothing deals, travel deals, restaurant deals, activities, adult events and kids’ events. Have fun saving!!! I love me some Medieval Times. The kiddo and I need some wuality time after my long hours out in at this years Oc Fair! This is an awesome giveaway! I’ve been once to Medieval Times and some friends of mine are having an anniversary coming up and I’d love to take them!! Thanks for the awesome chance to win though! I was thinking about spending a weekend in Washington DC. for my husband and I, 2 year anniversary. I was thinking this would be a great experience. I would love to get The Free tickets so that we have more to spend on other things around town. I haven’t been to this fair before. I’d like to go, though. Merlin makes me want to see what it would be like to get a taste of these times. Also I know several people who love going. My kids would LOVE this!! Your pictures are great!! My favorite memory is watching my daughter catch a flower from our knight! I’ve never been but it looks so fun!! Id love to win because I had my sweet 16 and bacorlette party at medieval times and would love to continue my love of the place onto my kids. I have not been able to see the new show because of financial reasons but im so dying to!!!! Keeping my fingers crossed. Best memory was my dad taking me to the one in myrtle beach the first weekend it was open. I love medieval! I love the clothes, everything. Thank you for sharing this. Great great giveaway! 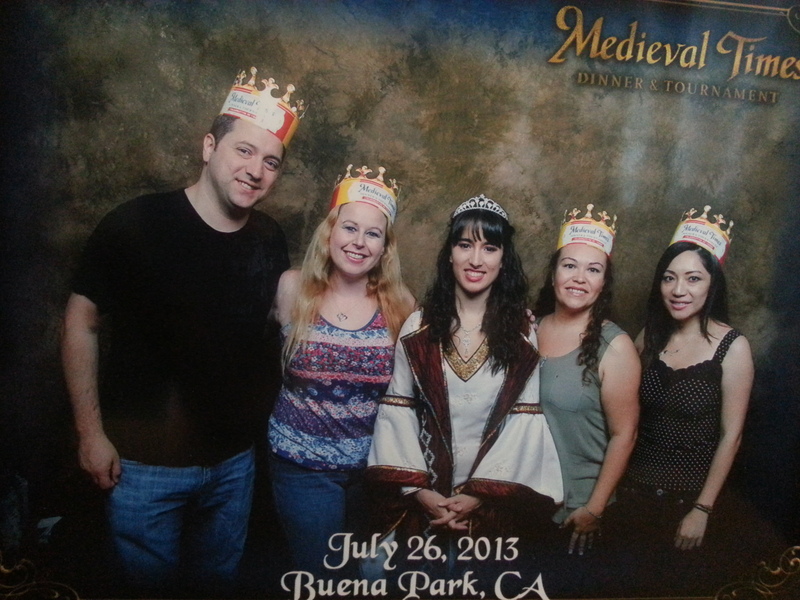 I’ve been twice to Medieval Times and the entire family loved it! Excellent idea for an anniversary or birthday, just awesome! Love the hats, Danielle! How do you ever keep from gaining weight eating all these foods? I would weigh 4 tons… Lol! Wow, that looks like fun! Great blog!! It is a fun time and something different to do Sharon:) You should check it out!